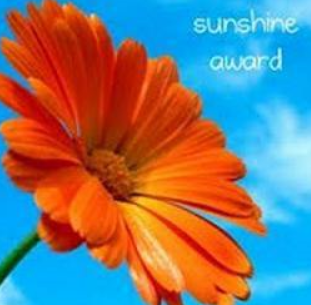 I decided on the Blog Sunshine Award, which will no doubt be a surprise to my husband and son. Both of them thankfully follow my blog (I think I threatened them if they didn’t), and often moan about the fact that too many of my posts are, as they describe them, “tear-jerkers.” I must confess that their comments surprise me, as that is not my intention on Soul Gatherings. My hope with this blog is to inspire my readers with stories about the triumph of the human spirit; of what happens when ordinary people do extraordinary things, from which either one of us, or all of us, benefits. People reaching out to others – whether by words, actions, thoughts, photographs – people touching others. In almost all the cases, the people I write about or the quotations I post have touched my heart. I pass them along so that they might touch yours. That’s where the Blog Sunshine Award comes in – if some of the posts elicit a few tears, then they were poignant and meaningful and inspiring. Mission accomplished! And when folks reblog some of the posts, that’s even better. Contrary to popular belief, tears can be a good thing, too. 1) I have never regretted my career change in mid-life. 2) I have a passion for ancient civilizations. 3) I have a passion for visiting the locations of ancient civilizations. 4) I read 5 different archaeology magazines each month. 5) I admit to watching Amazing Race and Survivor because I love to “profile” and “diagnose” (in a psychology sense) the participants from afar. 7) There’s a reason for everything. Yes – even suffering. This entry was posted in Gratitude, Uncategorized and tagged gratitude, spirit. Bookmark the permalink. You’re welcome! Thanks for your offer to help with the links, but I actually (finally) figured it out for the “Last Lecture” post. Thank you so much for nominating http://travellivelife.com/ . It;s an honor!